For climate change, Florida is the ballgame. So says Rafe Pomerance, a man who has worked longer to stave off the threat of global warming than just about anybody. If the national politics on climate change is ever to shift from denial to action — in time to stop the disgorging of carbon dioxide beyond the point of no return — Florida, he says, is the key. Why? Because no other state is under greater immediate threat from the warming planet and rise in sea levels. And no other swing state has so many electoral votes. This assessment comes from the original climate-change warrior. Almost nobody had heard of global warming when Pomerance first stumbled upon the concept in 1979. Then a lobbyist for Friends of the Earth, he was plowing through a technical government report on coal when he was stopped cold by a seemingly out-of-nowhere remark that the continued use of fossil fuels might, within a few decades, “bring about significant and damaging” changes to the global atmosphere. Stunned, he started asking around: who knew about this threat? A geophysicist named Gordon MacDonald did, one of the few. Quickly, Pomerance set up meetings for MacDonald with the Environmental Protection Agency (EPA), National Security Council, New York Times, all the way up to the Carter White House. Soon, “global warming,” the “greenhouse effect” and “climate change” were common parlance. Within a decade, the world’s nations came within a few signatures of a treaty that just might have saved the planet — but didn’t. The story is told in a remarkable article that takes up the whole issue of the Aug. 5 New York Times Magazine, “Losing Earth: The Decade We Almost Stopped Climate Change,” by Nathaniel Rich. Pomerance is a major figure in the 30,000-word retrospective, which ends its tale in 1989. But Pomerance didn’t quit then. He has continued to be a tireless activist on global warming, including a stint in the State Department as the Kyoto Protocol was being negotiated. The United States withdrew from that agreement to cut carbon emissions, the George W. Bush administration complaining that developing countries including China were excluded. Just as, last year, the Trump administration pulled out of the Paris Climate Accords. The consequences of these failures are sobering, if not flat-out frightening. “The Paris climate agreement — the nonbinding, unenforceable and already unheeded treaty signed on Earth Day in 2016 — hoped to restrict warming to two degrees. The odds of succeeding, according to a recent study based on current emissions trends, are one in 20. If by some miracle we are able to limit warming to two degrees, we will only have to negotiate the extinction of the world’s tropical reefs, sea-level rise of several meters and the abandonment of the Persian Gulf. Sea-level rise of several meters. That’s a projection for catastrophe in Florida. Our vulnerability is nothing less than an existential threat. Yet, the state’s leadership couldn’t be more ostrich-like. That’s why Pomerance, still going strong at age 72, is now focused on Florida. Pomerance can imagine many things that a climate-conscious governor (as opposed to the climate-denying governor we’ve had for eight years) might do to ignite action, causing ripples that carry way beyond state lines. Convening the governors of other southern coastal states, like Louisiana, Texas, Georgia and the Carolinas, for a vigorous fight for self-preservation. Or being an outspoken proponent of a carbon tax to discourage emissions — a move that would have to be bipartisan to get traction. Bipartisan? Don’t scoff. Although the Republican Party teems with climate-denial, that’s not always the case at the local level, especially when the localities are already feeling the effects. Just last month, U.S. Rep. Carlos Curbelo, a Republican representing Florida’s southern tip — make that Florida’s extremely vulnerable southern tip — broke with his party’s orthodoxy to propose a carbon tax. He introduced a bill that went nowhere but showed that even the most rigid ideology is susceptible to an unyielding reality. In the Southeast Florida Regional Climate Compact, the joint effort by Palm Beach, Broward, Miami-Dade and Monroe counties to get proactive on sea-level rise, some local Republican officeholders and business people are deeply involved. Once upon a time, we had two major parties that evinced concern for the environment, but the dominant strain of Republican dogma today holds with the fossil fuel industry’s invented “controversy” over a supposed split among scientists on whether climate change is man-made. In fact, at least 97 percent of climate scientists agree that the extraordinary warming trends over the past century are “extremely likely due to human activities,” according to NASA. The essential facts about greenhouse gases have been known since the 1970s. What holds back action in this country isn’t doubt about the science. It’s politics. Republicans routinely contend that environmental-friendly policies kill the economy. Tell that to California, with those tough auto-emissions standards and a 2006 state law, signed by Republican Gov. Arnold Schwartzenegger, requiring emissions from all sources to be cut back to 1990 levels by 2020. That poor, hurting state is now the world’s fifth largest economy. Still, we hear inanities like this from Republican governor hopeful Ron DeSantis, asked on Wednesday if he thinks climate change is a factor in the red tide that’s killing marine life and tourism on Florida’s west coast. It “may be a factor,” but climate change isn’t really a problem for state government, DeSantis said. And while he believes the state ought to protect against sea-level rise, he seemed to question whether human activity has anything to do with it. We’ve heard pussyfooting like this from Florida politicians before. And we should be sick of it. If you worry that your house might burn down, you don’t slap up fire-retardant all over the place — while leaving a bunch of candles burning. You do something about the cause. We know that greenhouse gases are warming the atmosphere. The added heat is melting the Arctic and Antarctic ice caps. 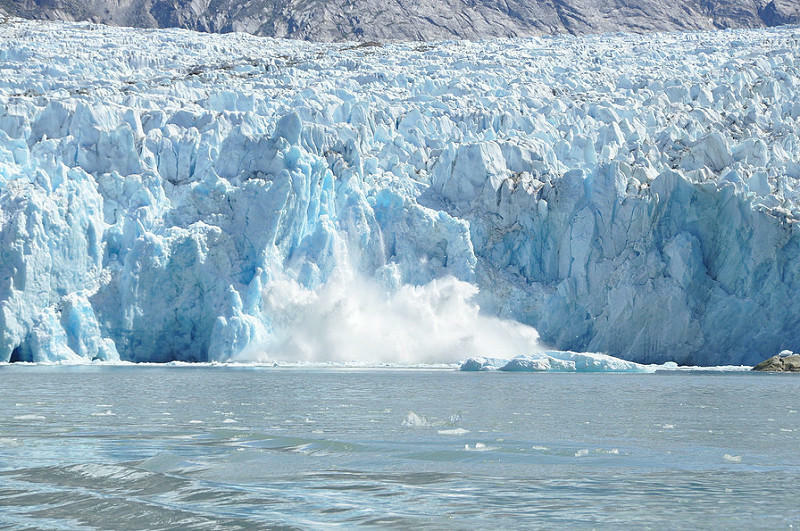 The melting ice sheets are raising sea levels. Here and around the world. It’s urgent that we slash carbon emissions. We need state leaders with the courage to push for it as soon as possible. With sunny-day flooding now a Florida reality, with king tides now a part of our vocabulary, time is not on our side. Remember that in the voting booth this year. Howard Goodman is an editorial writer for The Palm Beach Post.